By the late-1970s smaller foreign 2+2 sport coupes were hitting the U.S. shores. Some of these were from Europe, and some were from Japan. Japanese cars before this surge were merely small economy cars. The new surge of 2+2 coupes included such icons as the Toyota Celica Supra and (2+2) Datsun 280ZX. By the late-1980s every Japanese brand would have at least one sport 2+2 coupe, some would have multiple models to compete in the U.S. market. These foreign sport coupes generally were light and nimble and were powered by 4-cylinder and 6-cylinder motors. This was appealing to many buyers since they could own a sporty car with good handling and acceleration that got reasonably good gas mileage. Chevrolet had its bases covered in during the initial surge in the late-1970s with the rear-wheel drive sporty 2-door Monza which was a light (at a curb weight of only 2,800 lbs) and nimble and could be equipped with a 4 cylinder, V6, or a V8. Unfortunately the Monza was only produced for the 1975-1980 model years. Its replacement was the front-wheel drive 1982 Chevrolet Cavalier which wasn’t up to the task of competing with the new foreign 2+2 sports coupes – many of which were rear-wheel drive. However Chevrolet had a plan. Its Camaro during the 1970s had some European flair mixed with available good old American V8 power under the hood. Only one problem, the sporty V8 powered Camaros of the 1970s had an average curb weight of 3,500 lbs. Which by 1970s 2+2 sporty coupe standards was extremely portly like Marlon Brando in his later years. By the early 1980s the European and Japanese 2+2 coupes were growing in size with many hitting (or getting close to) the 3,000 lb mark. For instance the all-new 1982 Toyota Supra had a curb weight of 3,045 lbs. Chevrolet’s answer to this new 2+2 playing field was the all new third generation 1982 Camaro Berlinetta which weighed in at only 2,880 lbs. 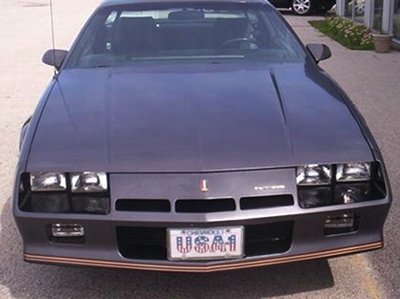 There was also the 1982 Camaro Z28 for traditional muscle car buyers – standard V8 power, top notch handling, and plenty of air dams and spoilers. The Camaro Z28 competed against the new 1982 Ford Mustang GT and its GM F-body brother the 1982 Pontiac Trans Am. When Car and Driver magazine (August 1982) did a comparison test of the 1982 Camaro Z28, 1982 Trans Am, and Mustang GT; it pitted these three American 2+2 coupes against the V8 powered 1982 Porsche 928 which was four times the base price of these three American GT cars. 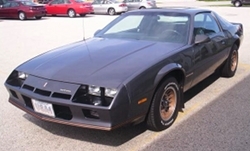 And there was the base 1982 Camaro which was marketed by Chevrolet as the "Camaro sport coupe" – aimed directly at pleasing the frugal 2+2 buyer. It was between the Camaro sport coupe and Z28 hierarchical scale where the Berlinetta came into the picture – it was the perfect touring type 2+2 coupe to battle with the new crop of Japanese and (lower priced) European 2+2 sports coupes. Where the Z28 had a boy racer type look with air dams and spoilers, the Berlinetta had a streamlined elegant look that was more in tune to the look of an European touring car. Chevrolet used gold emblems and striping on the body. The Berlinetta’s front beak was more refined since it didn’t use the Z28’s front lower air dam and had a group of three small air inlets towards the top of its nose (something the Z28 didn’t have). The Berlinetta also didn’t use the Z28’s lower side and rear air dams. And even when no rear decklid spoiler was ordered with the Berlinetta (the rear decklid spoiler was optional), the overall look was still extremely sporty. Adding to the look all the crevices in the frontal area had black accents. The side mirrors on the Berlinetta were also painted body color like the Z28’s (the Camaro sport coupe had black colored mirrors). The Camaro sport coupe also had this streamlined exterior look, but the look was ruined by the budget style trim decor which made the base Camaro look like a 2+2 fleet car. And nowhere was this more apparent than inside the interior cabin with the base seats which had that quintessential stripper car look. However the exterior on the base car could be dressed up with a set of understated sporty body colored steel 14 x 6 inch rally wheels and the interior could be dolled up with a whole host of options. When this was done the sport coupe hit Berlinetta price territory. And lining up the sport coupe next to the Berlinetta, there was no comparison the Berlinetta had polish and flair – it was a class act. Everything from it’s standard 14 x 7 inch decorative aluminum wheels with gold accents (which it didn’t share with the Z28 or sport coupe) to its standard luxurious looking interior that included a set of plush cloth bucket seats. 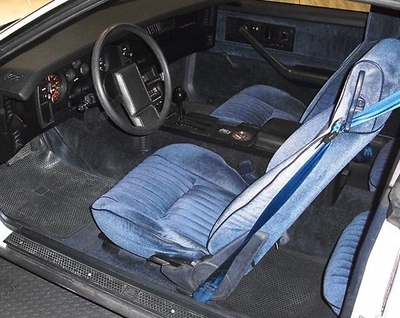 This upscale interior with plush seats could be ordered on the Z28 but was not standard. Just like the other 1982 Camaros, the Berlinetta also received a space age looking dashboard layout. The previous generation 1970-1981 Camaro was stuck with a dash look and design that dated back to the early 1970s, with the all-new 1982 design, the Camaro had leapfrogged the Camaro’s interior into the twenty first century almost twenty years early – the modern aircraft style dash layout was the reason behind this. Adding to the Berlinetta’s sporty image was a very modern center console which was standard. The smart buyer also opted for the round analog clock which was mounted inside this center console. The clock was a work of modern art since its glass cover was flush with the rest of the top console surface – it wasn’t situated in the easiest place to check the time but it sure was cool looking. The console clock was a rare Camaro option which is a much sought after today by third generation Camaro buyers. The Berlinetta since its introduction in 1979, had the task of being the luxury oriented Camaro. The base Camaro coupe was marketed directly to the entry level sports car buyer who wanted a sporty package at a budget price. The Camaro Z28 which had returned to the Camaro lineup for 1977, after a brief hiatus, was a bare knuckle brawler in the performance arena. The Z28 competed with the Pontiac Trans Am and the few remaining American performance cars (all of which you could count on the fingers on one hand). If a buyer wanted a throaty deep resonance performance oriented V8 along with good handling, the Z28 was the only Camaro up to the task. For the remaining muscle car buyers who had been abandoned by Detroit after the original muscle car era ended, the Z28 was exactly what these muscle car buyers craved. The Z28 may have taken a extra two seconds or more to make it down the 1/4 mile strip by the late-1970s when compared to fastest muscle cars of the golden era, it still was one of the best performance packages to be found during this era of performance malaise. During the 1970s, many car makers were piling on the power and luxury options since many buyers were waiting in line to pay extra for these options. For the most part the Camaro coupe and Z28 models of the 1970s were not loaded with options. Most Camaro buyers tended to be frugal with the option list. Generally if a buyer wanted a luxury interior and a plethora of power options, this buyer bypassed the Chevrolet dealership and went straight to a Pontiac dealership. This is why on the average the Pontiac Firebirds and Trans Ams of the 1970s were loaded with a lot more options than the Camaros (including Z28s) of this era. Chevrolet saw this as a problem and felt the 1979 Camaro Berlinetta was just the ticket for bringing in the more affluent buyer who wanted a more upscale interior and other options in a sporty 2-door coupe. Where its predecessor the Camaro LT, (the "LT" was short for Luxury Touring), the Berlinetta was more luxury oriented. The net result of this original experiment was that Berlinetta sales were good however Chevrolet hit its intended target a little too well. 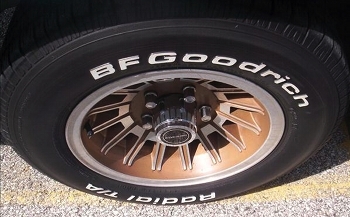 Many Berlinettas rolled off Chevrolet new car lots during the 1979-1981 model years with luxury oriented wire wheels. The Berlinetta looked closer in lineage to the Chevrolet Caprice Classic rather than the Camaro Z28 – the Berlinetta was hurting the Camaro’s sporty image. That’s where 1982 Camaro Berlinetta came into the picture. No longer would it just be a plush Camaro with lots of options. No sir, its new mission was that of a upscale European style touring car as previously mentioned. Where the 1982 Camaro coupe was standard with the GM Iron Duke (2.5 liter 4-cylinder which produced 92 horsepower and 132 lb-ft of torque), the Berlinetta proved it was more performance oriented than the coupe by offering a standard LC1 2-bbl 2.8 liter V6 which produced 102 horsepower and 142 lb-ft of torque. The 2.8 liter on paper didn’t make that much more horsepower and torque than the Iron Duke, however its peak torque was available lower in the rpm range (2400 versus 2800 rpm of the Iron Duke). The hidden advantage of the 2.8 liter V6 was it was very small V6 – much smaller in overall dimensions and and light as a feather compared to Buick’s 3.8 liter V6. The light V6 allowed the Berlinetta to be loaded with options and still not surpass the 3,000 lb mark. The 2.8 liter V6 could be equipped with either a 3-speed automatic or 4-speed manual transmission. The 4-speed manual was the smart choice since it brought out the best in the 2.8 liter V6 giving it a slight performance advantage over the 3-speed automatic. However the 4-speed with its advantages did fall short compared to some of the new sporty touring coupes from Europe and Japan which had 5-speed manual transmissions as standard – 5th gear on these cars acted as an overdrive gear keeping highway rpms to a minimum which also raised fuel economy ratings. Same could be said about the 3-speed automatic, it was also antiquated with not having an overdrive gear. Chevrolet would fix this problem for 1983 by replacing the 3-speed automatic with a 4-speed (with overdrive) automatic, and replacing the 4-speed manual with a new smooth shifting Borg Wagner T5 5-speed manual transmission. There was another problem for the V6 Berlinetta, it couldn’t compete performance wise with the higher horsepower sporty touring coupes from Europe or Japan. For some of these cars, even in the dark days of new EPA mandates, had horsepower ratings which were now approaching or slightly exceeding the 140 horsepower mark. 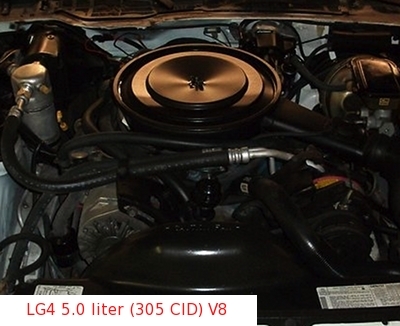 Fortunately Chevrolet offered the Z28’s standard engine, the LG4 4-bbl 5.0 liter (305 CID) V8, as a Berlinetta option. The good news was it produced 145 horsepower and 245 lb-ft of torque, which was enough power to keep the competition at bay. The bad news was the 4-speed manual transmission which was available with the LG4 equipped Z28, was not offered with the LG4 equipped Berlinetta. The 3-speed automatic was the mandatory transmission for the LG4 equipped Berlinetta. Even so, the LG4 gave the Berlinetta enough kick to keep it at the top end of the performance scale when compared to most of its competitors. The LG4 powered Berlinetta took around 9.5 seconds to move 0-60 mph and a little over 17 seconds to do the 1/4 mile. These were some pretty respectable figures when you consider this was the era when any car that went 0-60 mph in less than 10 seconds was a fast car. Unfortunately, Chevrolet decided not to offer the Z28’s top performance motor for 1982, the LU5 165 horsepower Cross-Fire Injected 5.0 liter (305 CID) V8. A LU5 powered Berlinetta would have been good for mid-8 second 0-60 mph times. The Berlinetta’s handling was also very good, it had a sport tuned handling package which consisted of 14×7 inch finned aluminum wheels as previously mentioned and P205-70/R14 tires. Most sports car enthusiasts back in the day would have been pleased with the Berlinetta’s handling manners and overall suspension feel in the hairpin turns. However the Z28’s take no prisoners suspension with thicker anti-roll bars, heavy duty springs, and stiffer shocks along with having meatier P215-65/R15 tires mounted on 15×7 inch wheels produced world class handling numbers that easy overshadowing the Berlinetta’s handling figures. It was this type of marketing attitude of saving the best suspension and handling related parts along with the hottest V8 motors for just the Z28 (and later Iroc-Z) that led to the undoing of the Berlinetta. The Berlinetta with it’s lighter weight would have really shined with the Z28’s world class suspension. There’s no doubt the all-new 1982 Camaro was the talk of the automotive world back in 1982. And the Berlinetta definitely delivered on its mission of being the European style sporty touring coupe. And with a base price of just $9,266 for the V6 equipped Berlinetta and only $9,436 for the V8 equipped Berlinetta, it was a downright bargain (the Camaro sport coupe started at $7,681 and the Z28’s base price was $9,700). 1982 Berlinetta production (39,744) was about 21 percent of total Camaro production for 1982. Berlinetta production doubled over 1981 Berlinetta production – which further proved Chevrolet was on the right path with the all-new Berlinetta. But unlike many GM product stories of the 1980s era, Chevrolet didn’t rest on its laurels with the Berlinetta. It improved the package for 1983 by offering a 5-speed manual transmission option for the LG4, and for 1984 it offered (as a Berlinetta only) option spectacular space age digital gauges (which even included digital radio readouts and enough computer type push buttons to please any nerd). By 1985, a zippy 130 horsepower 2.8 liter multi-port fuel injected V6 was standard. Unfortunately sales dropped sharply to only 4,479 units for 1986, causing Chevrolet to pull the plug on the Berlinetta after the 1986 model year. By the end of the 1980s, the reasonably priced European touring coupes were gone or had moved heavily up the price range. However the Japanese sporty 2-door coupes were reasonably priced and very popular, not to mention had by this time garnered a nice chunk of the US new car market share. Unfortunately the Camaro Berlinetta wasn’t around to compete with these fine cars. 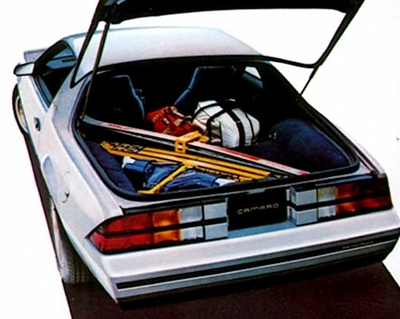 Chevrolet had seen the future and with the 1982 Berlinetta, it had given the Camaro the goods and style to compete with the new Japanese sporty coupes. Unfortunately the Berlinetta was a victim of the Z28 and Iroc-Z (which from 1985-1990 was the top performance Camaro). Chevrolet saved the best engines and handling for these cars instead of sharing with the lighter more waif Berlinetta. If only Chevrolet had offered the best handling goodies and engines in the Berlinetta, it would have remained the light European touring Camaro. Pontiac to a lesser degree did this with the 1987-2002 Firebird Formula (which offered the Trans Am’s performance goodies in the lower price and lighter Formula). And who knows, maybe a top performance Berlinetta such as this would have taken away some of those 1980s 5.0 liter Mustang sales. Enough with the theorizing, the fact still remains the 1982 Camaro Berlinetta was the perfect balance of power and elegant styling and had tons of sophisticated European flair. No performance Camaro since the death of the Berlinetta can say this.